Kings make out with bumble bees, pirates make out with police officers. Strangers share glasses and crack jokes as if they were old friends. Dancers fight for space with saxophonists, trombonists and drummers down narrow streets that smell like sweat and beer. This is Carnaval in Olinda, one of the biggest and brashest parties in Brazil. 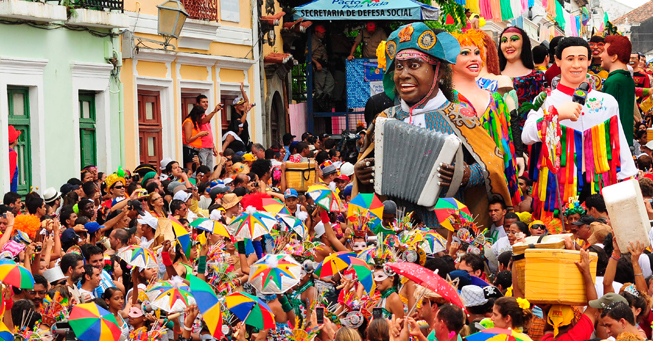 Giant puppets are one of the traditions of Carnaval in Olinda. Rio de Janeiro and Salvador are home to the first and second biggest Carnaval celebrations in the world. In these cities, performance groups called blocos (BLOH-koos) push their way through huge crowds along defined parade routes. The best option for a lot of visitors is to pay to participate in one of these blocos, as they provide a safe, roped-off space to dance and enjoy the spectacle.